Grand Am is Ten Years Old! Happy Birthday to its President, Roger Edmondson, and his gang of pirates down on West International Speedway Boulevard. 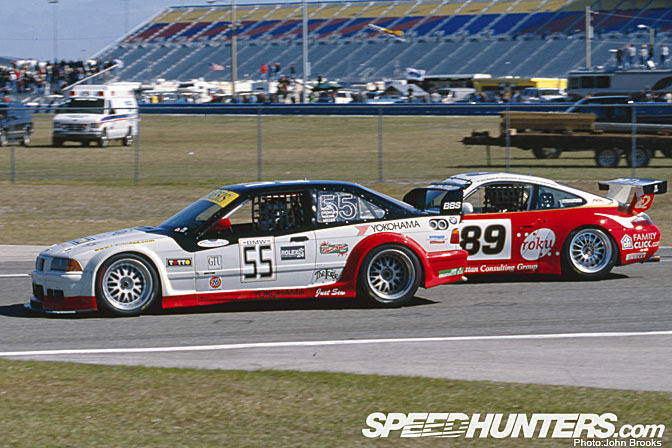 So as part of the December Review & Retrospective Month SpeedHunters will have a look at the first race that was sanctioned by Grand-Am or the Grand American Road Racing Association as it was called back then. 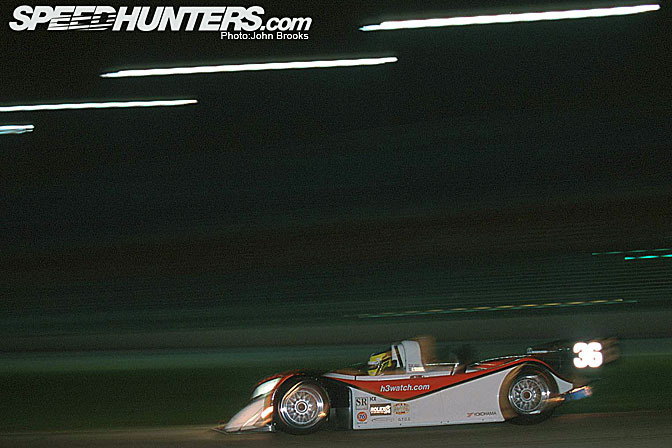 This was of course the 2000 Rolex 24 Hours held at Daytona International Speedway. 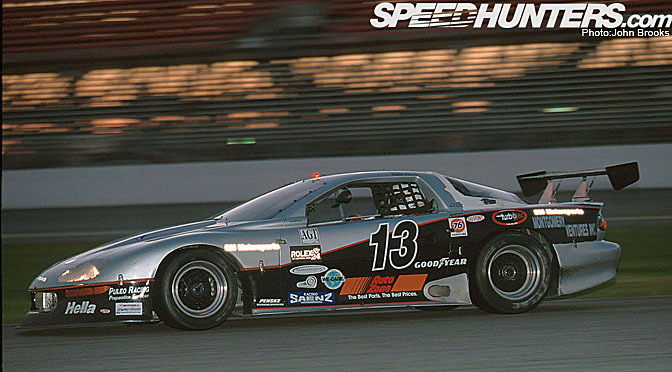 For most observers the first race was one of the high points in the whole decade of Grand-Am, starting the project at the highest level. 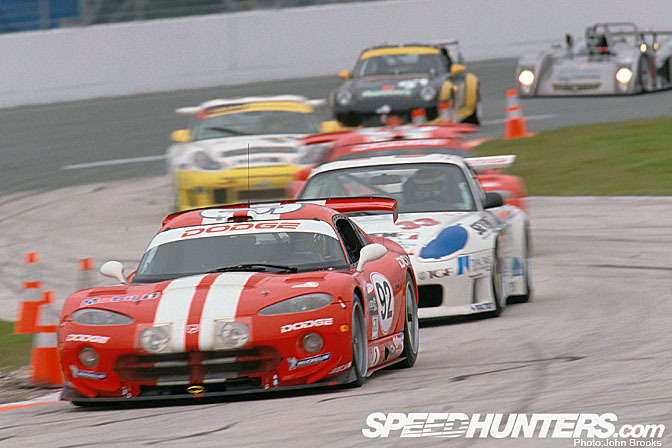 There were big battles everywhere, in the prototype and GT classes but nothing was more keenly anticipated than the fight in the GTO category between the Dodge Vipers and the Chevvy Corvettes. 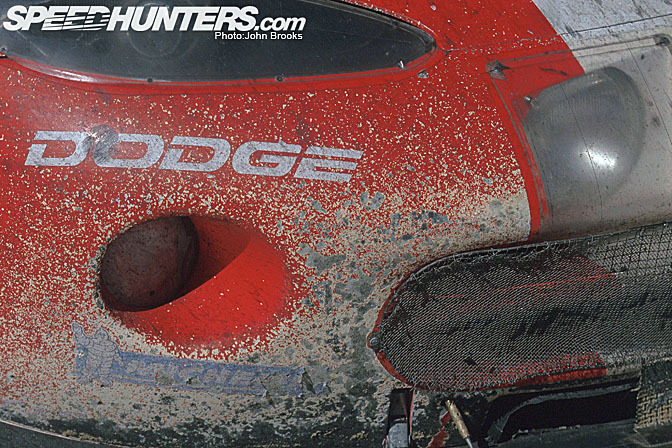 Two full factory outfits pitted three ORECA run Viper GTS-Rs against two Pratt & Miller C5-Rs, each with top line drivers, it was a Detroit Heavyweight Championship of the World Contest. 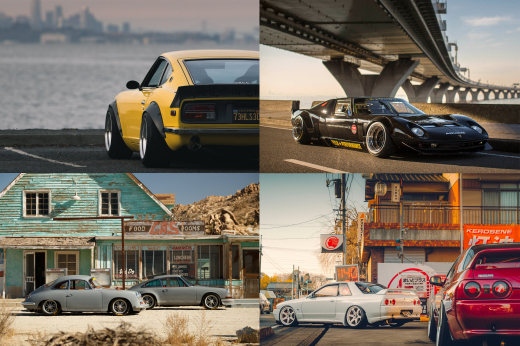 An automotive "Thrilla in Manila". That would be enough excitement for most races but there was more. After a gap of some 50 years Cadillac was back in competition with a Riley & Scott built prototype with victory at Daytona, Sebring and Le Mans the aim. Why, did this conservative brand feel the need to return to the tracks? While other automotive brands were heading towards nostalgic retro-style designs like the VW Beetle and the Ford Thunderbird, Cadillac had decided to march to a different drummer. Under the rallying cry "Art & Science" the brand was launched on a path to develop their range to be the equal of the likes of Lexus and the German trio, Audi, BMW and Mercedes Benz. 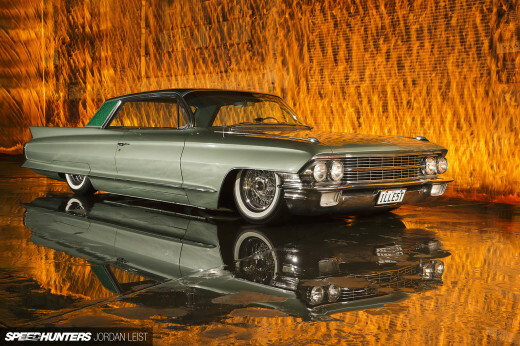 Another point of view expressed to me at the time was that Cadillac had to change and aim at a younger market, their existing customer base was dying off……….. 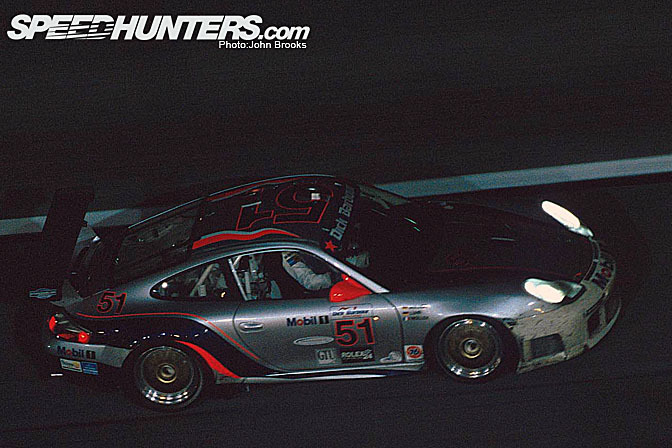 The 2000 Rolex 24 also witnessed the debut of the customer version of the Porsche 911 GT3R, there were 23 examples that would take the Green Flag at the Rolex, all that dot.com money was burning holes in pockets, or so we speculated The GT3R would be the car that would carry GT Racing forward around the world for the next few years. It had the first water cooled engine in a Porsche 911 based racing model. This is the Seikel car with the distinctive TDM colour scheme of owner Tony Burgess. Another GT3R was in the hands of of the youngest driver in the race, 17 year old Gunnar Jeannette and the oldest, Paul Newman. Newman was charming as long as you confined the talk to racing, when at the tracks he just wanted to be another driver and not the movie superstar. 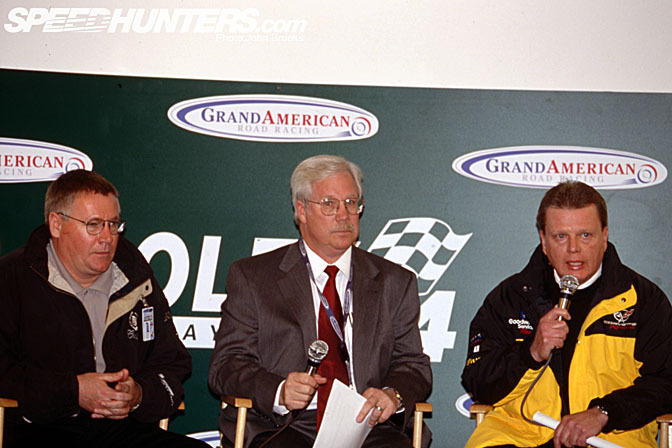 Newman won the GTO Daytona 24 title on his last attempt in 1995. "When we won it in 1995, when I was seventy, well, I'll give it another five years and come back again,"
When asked why he would enter such a grueling contest of speed and endurance, the 75 year old actor responded, "Just for the hell of it." 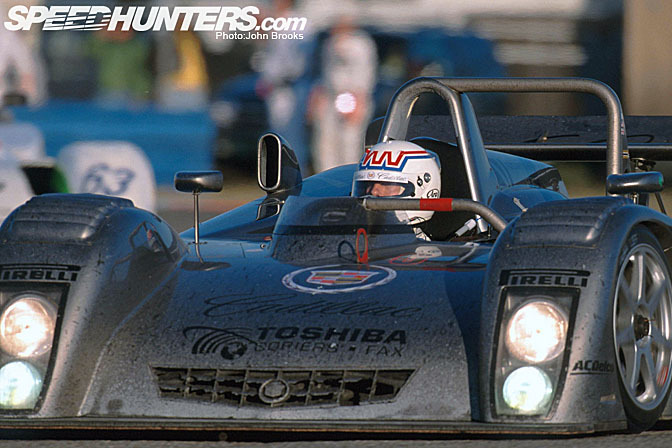 There were five classes of cars that were eligible to run in the 2000 Rolex 24, two prototype and three GT. The prototype rules were based on John Mangoletsi's Sports Racing World Cup and had SR1 and SR2 categories depending on power,engine size and budget. 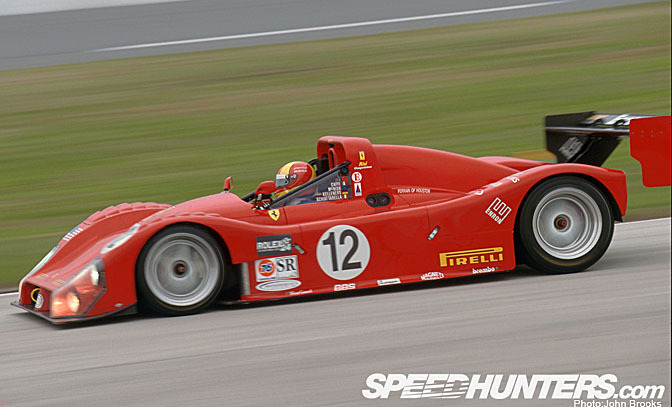 One of the most popular models was the Ferrari 333SP, here the Risi Competizione example with Allan McNish on a busman's holiday from Audi duties. There were three 333SPs on the grid, the howl of the 4 litre V12 was worth going a long way to hear. The Ferraris were outnumbered by six Riley & Scott MKlll powered by Ford and Chevrolet V8 engines. This is the Philip Creighton Motorsports entry. Also making a first appearance was Johansson Matthews Reynard 2KQ Judd. 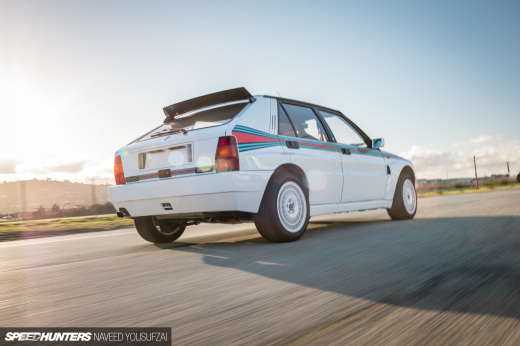 This advanced customer programme was a new departure for the world's biggest racecar constructor. 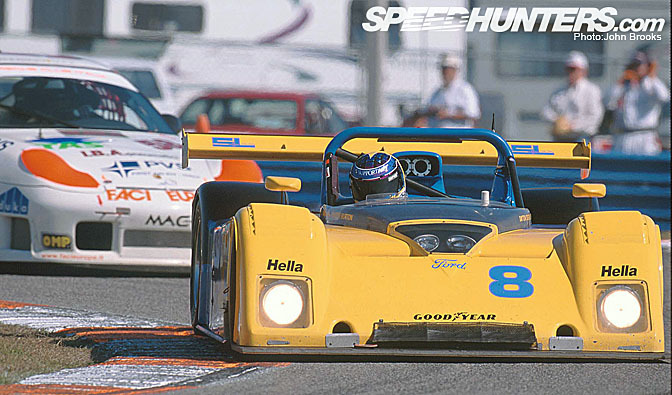 The year before Reynard had acquired Riley & Scott who, aside from providing the MKlll cars, also built and ran the Cadillac programme. A tangled web. 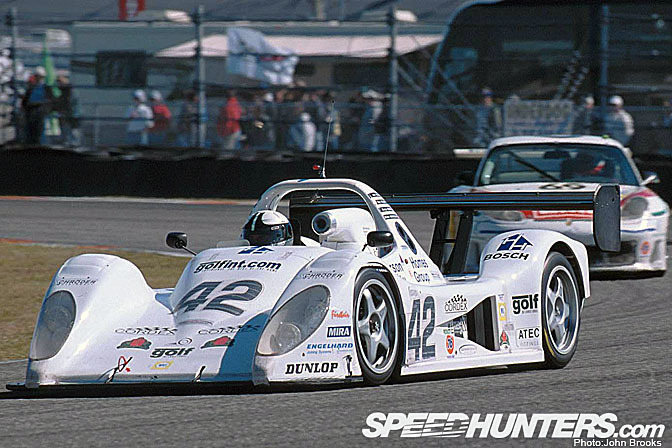 The prototype scene was finely balanced in 2000, the workhorses of the past five or six years, the Rileys and the Ferraris, were getting long in the tooth but were expected run reliably at the notoriously tough combined infield and banking layout of Daytona International Speedway. Both models had success in the past and would form the foundation of plans to run combined Grand-Am events with the Sports Racing World Cup. The plan was for John Mangoletsi to bring the cream of European prototype racing over to create a set of world class events. Cunning plan. 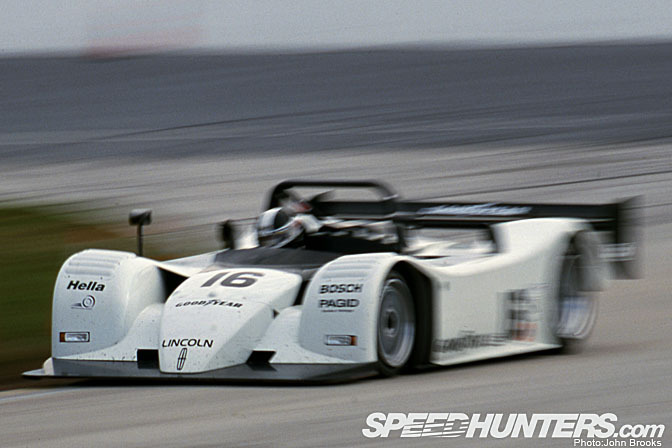 In the background, however was the the American Le Mans Series, running to Le Mans rules, that allowed full factory participation, specifically outlawed in SRWC land. Well not so much outlawed as price capped. 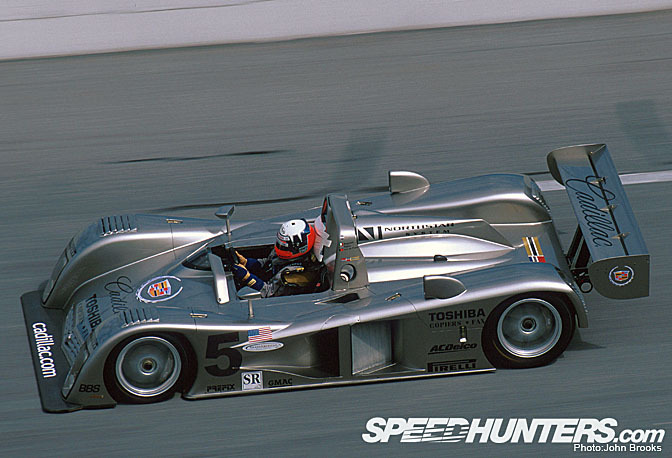 the top class of the category, SR1, had an on the track price limit of $640,000 including engine, SR2 was $201,000. The logic being that no constructor such as Lola or Reynard would sell cars at a loss, however, the factories like Cadillac could just factor any excess cost into their overall project budget and still sell cars under the price limit to any customers well heeled enough to afford them. After a promising first season in 1999, the ALMS was set to expand with Audi due to bring their latest car, the R8, to the tracks of North America to take on BMW. Would that prove to be a bigger draw than watching privateers in Grand-Am? The attractions of keeping onside with the ACO, organisers of Le Mans, and the halo effect of the top class factory battle meant that both Viper and Vette would direct their attention to the ALMS. Mention of the SR2 class? Well only the Pilbeam of Martin Henderson turned up, a bit disappointing but given that these cars were not originally intended or engineered to survive 24 hour races it was not a surprise. There were three GT classes, GTO translating roughly to the Le Mans LM GTS class. Top of the list were three Chrysler Vipers from ORECA, full factory supported entries. 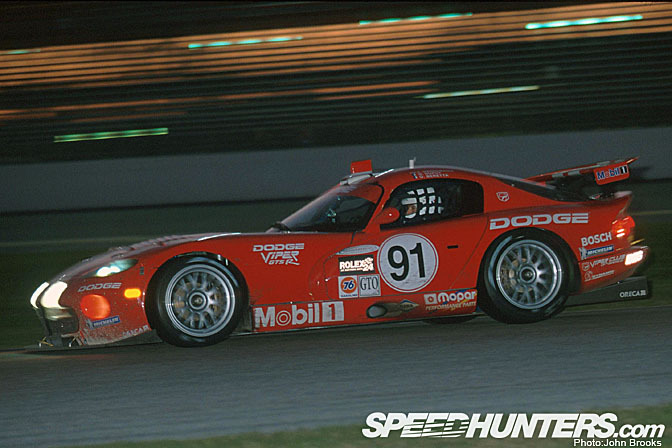 Based on the Viper GTS the GTS-R was one of the most successful GT cars in history. ORECA had achieved back to back success during 1998 and 1999, winning the FIA GT Championship, and taking class wins in the Le Mans 24 Hours plus the American Le Mans Sries drivers' and manufacturers' in '99. The French team were going to be very difficult to beat. The Viper had first appeared on the tracks back in 1996, powered by a V10 8 litre engine, which not surprisingly produced power and torque in abundance. The chassis had originally been massaged and built by our old friends, Reynard but by this stage in the project, ORECA had taken things in house. 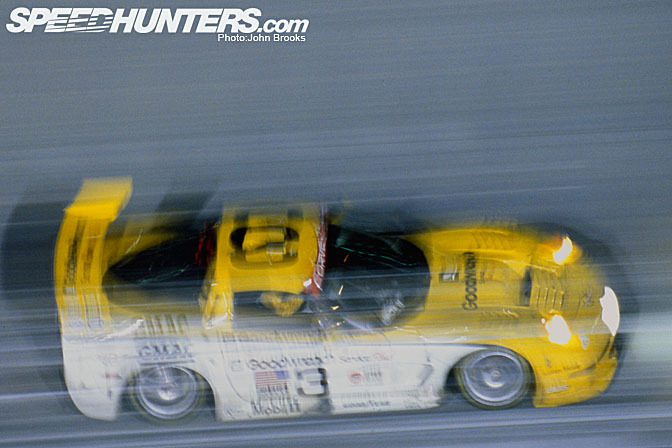 Up against them were two Corvette C5-Rs run by Pratt & Miller on behalf of General Motors. 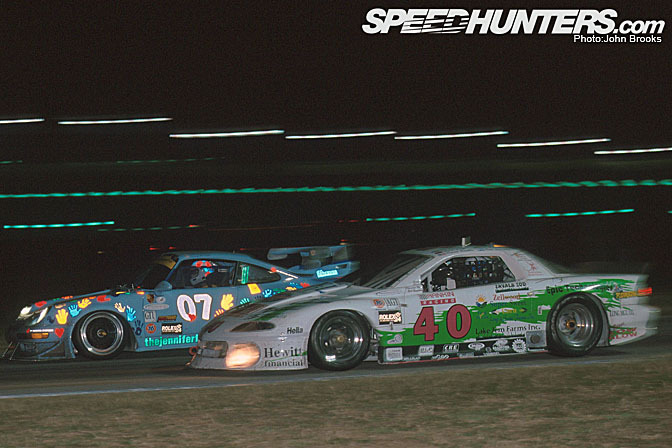 During the 1999 season the Vettes had gradually got closer to the Viper squad, going into the Floridian classic they were quietly confident of coming out on top. 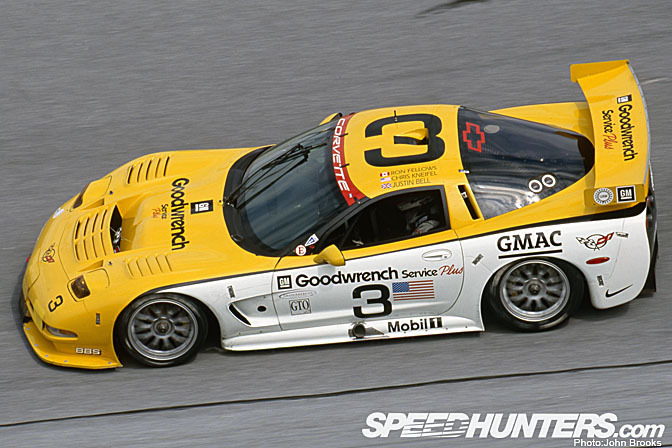 The Corvette, first raced in 1999, at the Rolex 24 had 7 litres of Detroit V8 to propel them along, it would be a mighty contest. If some disaster befell the factory squads then the out-gunned Porsche 911 GT2 would be around to pick up the pieces but that outcome was not expected. The Run What You Brung brigade were catered for in the A-GT class. They were tube framed, home built specials, regarded by the leading lights as mobile chicanes and not expected to feature in the grand scheme of things. As always, practice and qualifying dragged on through Thursday and Friday, giving everyone a chance to get back into the groove after the winter break and especially to get used to running in close proximity with 79 other cars. Traffic on the banking was manageable but on the infield and at the Bus Stop chicane at NASCAR 3 great care had to be taken to avoid problems arising out of speed differentials between the quick guys and the not so quick. This was the kind of thing to be avoided at all costs, backwards into the second horseshoe..not big or clever. At night the problem was even more acute. Somehow the drivers sorted it all out. Off track the activity was just as frenetic with Roger Edmondson, President of Grand-Am, here keen to cement alliances with General Motors amongst others. He had a series to promote and develop and was part of the gaggle of race series chasing the financial scraps that fell from the NASCAR table. Too much racing and not enough money, the perennial problem in motorsport. Meanwhile down in the garage areas the teams were racing against the clock to prepare their cars for the struggle ahead. 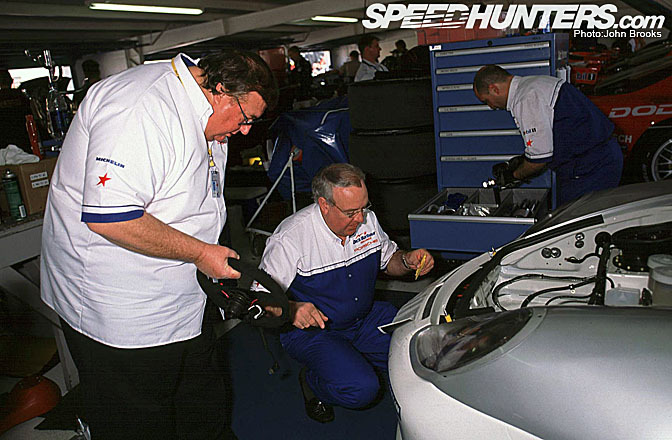 Here Barbour and Tony Dowe try to fettle what was widely regarded as the leading Porsche GT3R. Pole position went to James Weaver in the old faithful #20 Riley & Scott MKllll Ford who rattled round in 1:41.002. Actually the Dyson team entered their No. 20 car as being Lincoln powered. The team's Ford engines were prepared by Lozano Brothers Racing Engines. "We're just trying to work with our engine builders and engine developers to see what we can create, and maybe we'll create something," said team owner Rob Dyson. "You never know." This was trying tempt the Ford owned brand to come and fight with their American rival, Cadillac. Perhaps Dyson should have painted that car black with gold piping and called it a Cartier Town Car………white walled Goodyear slicks please for P Diddy Weaver………. 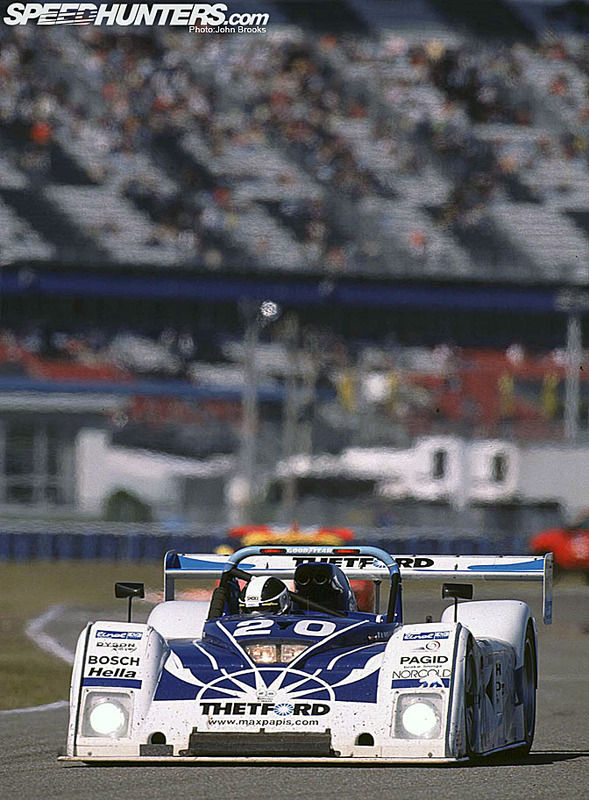 Dyson had run one of the new Reynards at the early January test sessions at Daytona but reverted to their Rileys for the race itself. "We were planning to have two Reynards," said Dyson. "Due to a number of problems, we were not able to get even one chassis working. Right after our test here we had to make the decision to run the Riley and Scott. Our objective is to win races. We just felt that we had a better chance of winning the race with the Riley & Scott rather than the Reynard. This is the Super Bowl of sports car racing. This is a race where we've been fortunate to win it, and that's our objective this time." 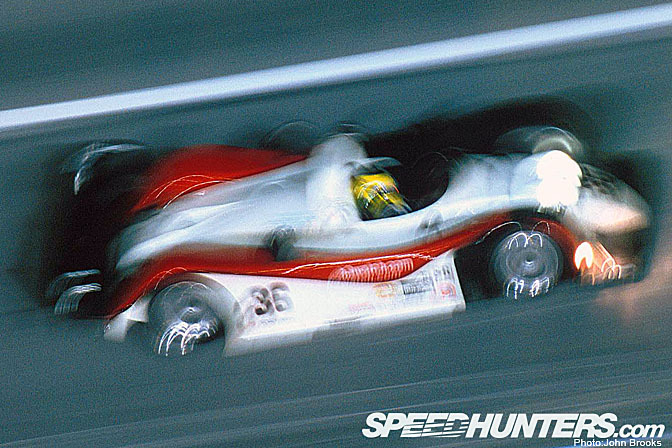 "We've got high hopes for the Reynard, I think any new car takes three or four months to get sorted out. I think Cadillac need a little more time as do Reynard," Weaver added. The Italian, nicknamed The Disco Kid during his F1 days was typically lyrical about his prospects, "This is a big event, I raced in Formula One, the top of racing cars, but this is a beautiful day in my life because Daytona is very famous, also in Europe. Especially in Italy, nobody forgets the finish of the three Ferraris in the late sixties. This is one of the most famous races and I'm very happy to be here." A local newspaper reporter's dream. GTO pole and first blood to Ron Fellows and the Corvette with a lap of 1:45.889. Ron, one of the smartest drivers you will ever meet was pleased. "This is our first pole with the Corvette so we're pretty happy. We really didn't do much since the test. We found a pretty good set up there. This morning we made one little change to the back and off we went to qualify. Right at the end of the second set of tires, I had a perfectly clear lap. The guys sent me out exactly at the right time. I was able to maximize the grip we had with the tires for one or two laps right at the end." Fellows was still realistic about the race, "We're still the underdogs here at the Rolex 24, these guys have won two straight Le Mans titles and we're still chasing them. But we've got the package together to race for 24 hours. It'll be a long race and the fastest car doesn't necessarily always win, anything can happen. You've got to be smart with so many cars. It really won't thin out until 1:00 or 2:00 in the morning. The biggest thing is traffic, just staying out of trouble." 1:52.028 was good enough to secure pole in GTU class with Dirk Muller on qualifying duties for Barbour Racing's GT3R. The loudspeakers were ringing out Friday at 6.30pm telling the faithful all to leave "The World Centre for Motorsport" for the day and head off to get rested in preparation for the race day. What would the Green Flag bring? I was there! 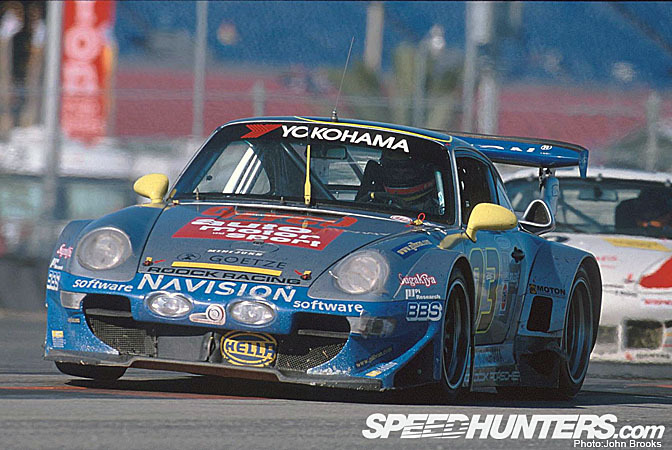 A friend of mine was working for G&W Porsche, who fielded the 07 Jennifer fund GTU 993 RSR, plus a brand new GT3R. I was privileged enough to get behind the wheel of the 07 after the race and check things out up close and personal...fantastic stuff. And yes, there was a TON of dot-com cash floating around that year, and the next few tool. Nearly every car is sporting some .com sponsorship which is no longer around. 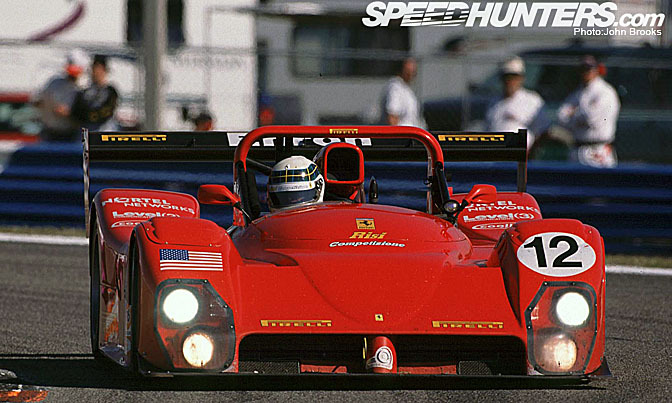 The Risi 333SP had an Enron (!) sponsorship as well! back before they became a road course nascar! I REMEMBER SEEING THOSE TEAM ORECA VIPERS ON TV....I WAS SO FASCINATED BY THEM ESPECIALLY WHEN THEY BATTLED IT OUT WITH THE CORVETTES....MOTORSPORT HEAVEN!!! Will get to see any more pics/info on the A-GT class? would love to see what people were turning out of their sheds ten years ago. P Diddy Weaver - brilliant. This weekend's "Rolex 24 at Daytona" will mark the race debut of the Audi R8 GRAND AM.